Simon and I have been doing NADAC off and on now for a little over three years and just earned our NATCH and V-NATCH last weekend after completing the last two elusive Chances runs under judge Scott Casino. He may be only 9 inches tall, but has proven that distance is not just for the big guys. NADAC is not the only venue we trial in, but it is a venue that I would never want to be without. The people are incredibly supportive and I love the types of courses that it offers. (Note) Click on the pictures and they will display a little larger. He is quite small, after all. I wanted to add a photo of Griffin. We are new to NADAC and entered our first trials this year. Griffin is a Glen of Imaal Terrier. This was after our second trial (photo taken at home) and there was one Q ribbon missing so we had 9 Q's! NADAC has really been a great confidence booster for Griffin. Cocoa looks so intense in this photo. Awww we have a Kachina on our SAR team. Little black lab puppy in training. My Ritzy used to visit anyone in the ring and back then when you went to the line they would often say, "Is this (dog's name)?" I knew when that happened that at some point in the run she was going to say hi as it would be rude to ignore them! She even greeted the judge if they were anywhere near the path. She literally figured those people were "obstacles" to perform. I didn't fight it - I actually put it on cue, so then I could call her away and move on to the next obstacle. I may have even taken advantage of it a few times to get a cross in... Eventually she sorted it all out, but those are some of my best agility memories with her. That is so cool Amata! Amazing! Love that, Amata! Until I heard of you and Edraith, I never knew there was such a thing as dogs finding caves. I'm curious how you got into it. I don't think it is a "thing" for dogs to find caves, she is the only one I know of! I got into caving in 2010, and joined a Cave/Cliff/High Angle Search and Rescue team in 2012. One of the earlier caving trips I did was in the UK, and there was a young 6mo old Aussie being trained for wilderness SAR I met. That prettymuch sparked my love of Aussies and the idea of using dogs for Search and Rescue. I couldn't have a dog though. My life and housing was not right for one. In 2013 that changed, and I started searching for a breeder, and got Edraith in 2014 for the purpose of training her in Search and Rescue (her name means "Rescue" in Elvish). Wilderness, not cave rescue (we are NASAR airscent certified), although she hangs out with our Cave unit (literally, sometimes, we do train in a dog life safety harness). Basically, I am on two teams - one is K9 and one is Cave. We hike a lot, and she has been underground. With the SAR training, I am used to reading her body langauge. I also know what her body language looks like when she gets excited to go underground. So one day when we were out ridgewalking (looking for new caves) and she was along. Caves have a unique ecosystem and have a distinct odor (likely due to the different soil / moisture / bacteria types - the odor varies by region, I can notice it so I am sure a dog can!). She stuck her nose to the ground - mind you no surface indication of a cave - and started showing me that "underground excitement" body language. I went over to check, and as you see in the video it's a barely noticeable spot in the leaves that is blowing out air. 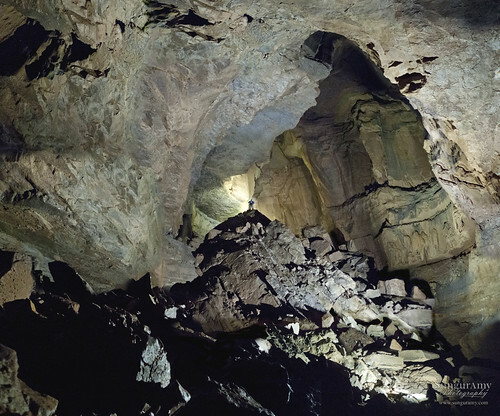 This is good news for cavers - pressure and temperature differences make caves "breathe" - and the more air movement, the larger the void underneath. Dug it open, down five pitches and a depth of over 350ft down and bam... Rest is history! She has found a few other caves as well, but none so impressive as that one. Basically I never specifically trained her to find caves, it is just a combo of what we do, she put two and two together when she recognized the scent, and I noticed and responded to what she was telling me because we have a partnership that I think is a little unique to SAR dogs. In more than any other "sport", the human is really just along for the ride and it's a matter of listening to your dog, rather than your dog listening to you. Thanks for the information! She is an amazing little dog. Good thing you have burly friends to dig out rocks! So is there an organization that you report cave finds to or you just tell the landowner? Very cool! I thought of you & your cave exploring when I was in Carlsbad Caverns recently. It was amazing to see and not to see (when the lights went out!). It depends on the state for reporting. Some states have a cave survey some dont. In this case yes we surveyed and reported it. Not all cavers survey (most dont), but my friends and I do. We use compass and inclinometers (either manual or in specialized digital builds for cave use) as well as sketch to scale. Then I draw up the final map.